Today only, while supplies last, Save up to 45% on Suncast coolers, prep stations and trash hideaway! 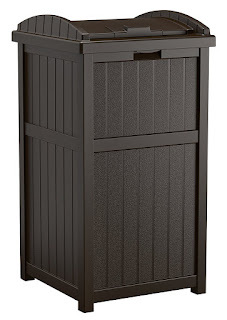 This Suncast Outdoor Trash Hideaway is ONLY $30.99 Shipped (Retail $59.99)! With the Suncast trash hideaway, you now have a unique, stylish way to store waste while entertaining on your deck or patio. The latching lid on this unit will keep all of your garbage in and any unwanted critters out. With a 30 - 30 gallon capacity, you will have more time with your friends and family, and less time having to change garbage bags.